THE REVIEW: Following a re-watch of Antoine Fuqua’s excellent Training Day, I decided to watch Brooklyn’s Finest. 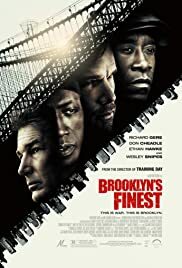 It is a decent film and echoes Fuqua’s style and some themes from Training Day, but as a whole, Brooklyn’s Finest misses its target and underwhelms as a result. Reading other reviews, many critics sole praise for the film centers around the acting and performances given by the ensemble cast. Brooklyn’s Finest is a film similar to Crash in that it follows three separate storylines of NYPD Officers which end up converging by the end into a single climax. The three main leads are Richard Gere, Don Cheadle, and Ethan Hawke who play veteran Officer Edward Dugan, undercover Detective Clarence “Tango” Butler, and narcotics Detective Sal Procida respectively. Of these three, the only performance I found remotely convincing was Ethan Hawke’s. His performance as Sal — the dirty cop pocketing cash from drug raids in order to provide for his family and purchase a new house for his sick wife — seemed authentic. You could see his guilt and reluctance to murder and steal drug money, but there’s also the love he has for his wife and kids which serves as his driving force and purpose in life. It’s a hard situation to be stuck in and Ethan Hawke easily conveys this duality. The other performances however I found to be disingenuous. As much as I enjoy seeing Don Cheadle, playing the drug-dealing gangster is not his forte. He does a good job playing the undercover cop part of the role, but when he is “Tango”, I couldn’t help but laugh and shake my head. Perhaps it wasn’t Cheadle’s fault and is more a representation of all the gangsters in the film — which features many alumni from The Wire. To date, The Wire is the most life-like and (what I can only assume) is the most accurate portrayal of life on the streets for drug dealers. Comparing every film or show I see from now on to The Wire may be a high bar and one not easily reached, but the performances given by all of the gangsters comes nowhere close and feels like a cartoon in comparison. Officer Dugan’s storyline was slightly better and showed almost the complete opposite of Sal’s, but there were also many unnecessary plot points and digressions which distracted from the good parts. Richard Gere does an OK job with the carefree attitude of Officer Dugan who is only seven days away from retirement and just wants to be out of the force, but the transition to the character he becomes at the end is abrupt and not clearly represented. The epiphany that Dugan somehow reaches isn’t matched in the audience’s perception. Throw in the whole divorce and prostitution subplots and more question marks are raised with Dugan than answers which help build his character. THE TAKEAWAY: The contrast between this film’s title Brooklyn’s Finest and the subject matter the film deals with — dirty cops, bad cops, and anything but the “finest” cops — could have made for an insightful and entertaining film, especially given director Antoine Fuqua’s past work. Unfortunately, this film fails in almost every way imaginable from subpar acting (with a few exceptions) and no suspense or tension that makes the film fall flat.